Have been reading everywhere and can’t seem to have found a solution so I have joined the nano reef community. 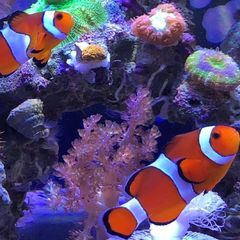 first of all thank you for all the answers to questions that have been relevant to me in my first reef tank, this website has helped me a lot already. 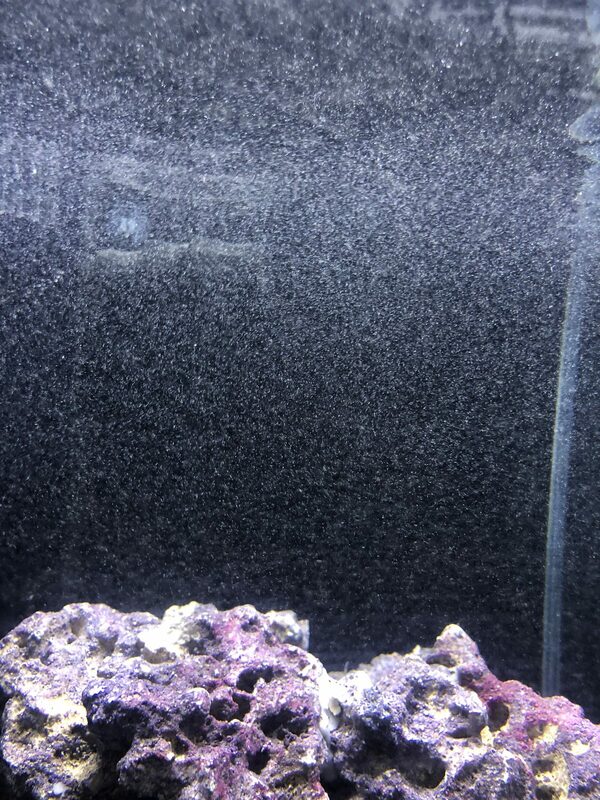 I am currently running a 90L nano reef tank that was an all-in-one-by aqua one. I am approximately 4 weeks into my fishless cycle with nitrites + nitrates still fairly high but what can you do. 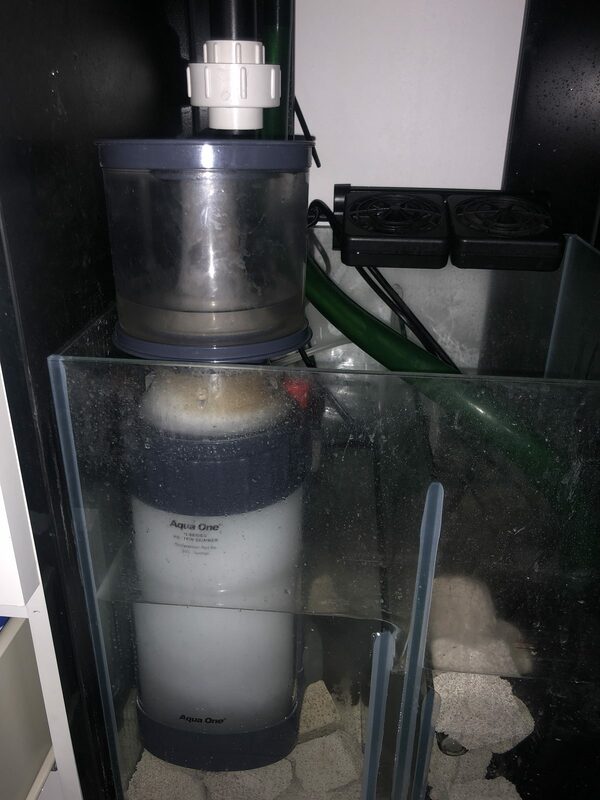 Regardless, I have the aquaone g226.. (I think) protein skimmer running in my sump, it has already collected skimmate - however there are millions upon millions of microbubbles in my tank. It seems too far along to have not broken in so I was wondering if anyone has had a problem with the same skimmer, and if there are any possible solutions? I don’t like the idea of just turning the skimmer off at night but it looks like it will have to come to that, I have also heard that a filter sock is a possible option too. Seems kind of strange. I don't see bubbles in the pic with the skimmer, but the display is full of them. Could something else be creating bubbles that are entering your return pump? If you shut off the skimmer, do the bubbles go away? The bubbles do go away within two minutes of turning off the skimmer. I got home today from work and the bubbles were gone, I then cleaned part of the skimmate and they’ve started again... it could be the way that the skimmer is sitting? I have no idea why it’s happening. There are definitely less in the display than there was when I made this post. Can you Block the baffles with foam to catch the bubbles? Its still probably just breaking in. Four weeks is pretty long. However, I agree, it will probably continue to improve. Keep cleaning it daily, even though that seemed to make it worse. There might be a way to adjust it. However, I'm not familiar with that skimmer. Cleaning it daily will def make it worse. Its the build up of scum and bacteria on the seams and parts of the skimmer that will keep the bubbles away. You could be right; but it might also be the oils from the manufacturing process. My thinking was that the film has started to cover the oil, and that cleaning exposed it again. However, repeated cleanings might actually help to remove it. Not really sure, just speculating. However, you should eventually be able to clean a skimmer without causing a ton of microbubbles. Thanks both of you, it means a lot. it seems to have died down again so it may be the way it was sitting or it’s just taking bigger steps to breaking in now. I will clean it again prior to adding live stock and if there are microbubbles after that I will just let it stay a little bit grimey in the future. I would just try to figure it out before adding livestock.